Terra Cotta Floor and Roof Arches. Burnt-clay products include brick, porous tile, and hard or dense tile. The latter two are commonly called terra cotta. The use of brick for arches between beams has, in building construction at least, become almost entirely obsolete. This is due largely to the saving in weight accomplished by the use of other materials. When brick arches are used, the construction is generally of the type shown by Plate II, Fig. 50. There is a patented system employing brick, which is known as the Rapp system. The bricks here do not form a self-supporting arch, but are laid flat between metal ribs or bars that spring between the steel beams. The use of burnt clay products in fireproof floor and roof arches and coverings of steel, is confined almost exclusively to terra cotta, and this is generally of the porous type. Porous terra cotta is lighter and less brittle than the hard tile, with probably almost equal strength. It is made by mixing straw with the clay, the mass, when burned, being thus left porous. It also has the advantage that it can be nailed into, this being especially important in roof and partition blocks. Terra cotta arches were formerly laid up exclusively with the ribs running parallel to the beams, this construction being known as side construction. Tests have shown, however, that the arch is stronger when laid with the ribs at right angles to the beams; and this practice, which is known as end construction, is now generally followed. Figs. 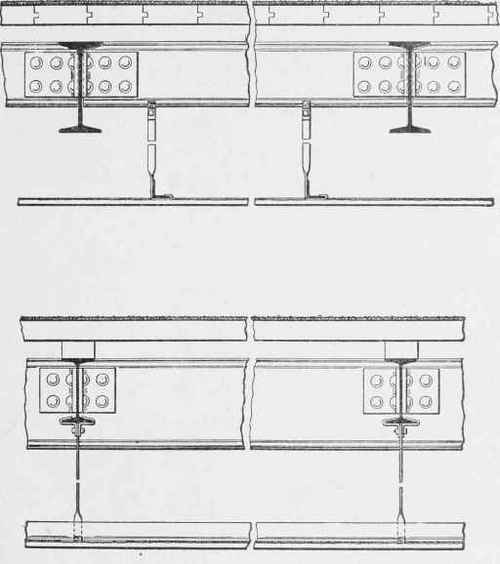 46 and 47 (Plate II) show these two constructions. An inspection of these cuts will show that the arch consists of a key, voussoirs, and skew-back, shaped similarly to the practice in masonry arches. It should be noticed that in side construction a special-shaped skew-back is required, which is not the case in end construction. Also notice that the piece protecting the flange of the beam is separate from the arch, this being a simpler plan than to shape the skew-back so as to cover the flange. The arch is generally two inches lower than the bottom of the beam, thus coming flush with the flange piece and giving a flush surface for plastering. The construction of wood screeds and top flooring shown is almost always used, although other forms could be adopted. The filling between the screeds should always be a cement concrete, . although cinders instead of stone may be used. The method of supporting the centers for these arches is shown by Fig. 52. This construction allows the centers to be readily removed after the arch has set. CENTERS FOR TERRA COTTA FLOOR ARCH. Fig. 52. The practice, in general, is to set the floor arches, from the lower floors up, after the steel frame has been carried several stories in advance. Centers used in the lower floors can be used in the upper floors unless the work progresses very rapidly. Roof arches, on account of the pitch of the beams, have to be furred down to give a level ceiling. 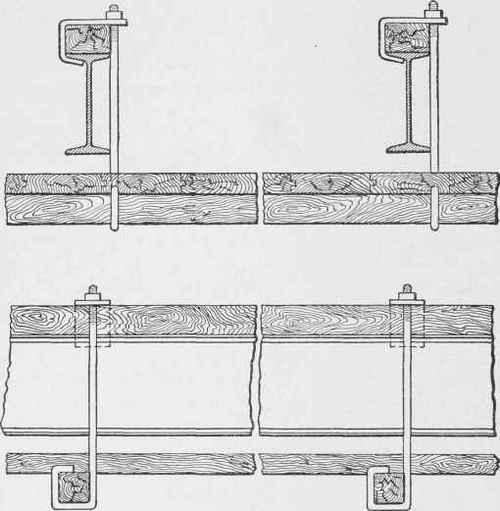 Terra cotta blocks may be used for this purpose, as shown in Fig. 48. It is, however, quite as common, even where terra cotta floor and roof arches are used, to form the furred-down ceilings of small channels or angles covered with some form of wire lath. A construction of this sort is shown in Fig. 53. Fig 53 depth of terra cotta arch required. The spans are kept within certain limits, and for such limits the proper depth of arch has been well determined. When it is desired to use terra cotta construction for heavy loads, such as in stores and warehouses, a segmental arch is used, generally 4 inches or 6 inches in thickness. The filling above the arch consists of concrete, either of stone or cinders. This construction is illustrated in Fig. 49. While greater spans are sometimes used, the best practice does not exceed about 8 feet, and is preferably limited to 6 feet. Guastavino Arch. This is a dome or vault system especially adapted for long spans where a flat ceiling effect is not essential, as in churches, libraries, halls, etc. The construction consists of several layers of hard tile one inch thick, laid breaking joints. The number of layers varies with the conditions, but generally does not exceed four. The rise of the dome is ordinarily not great; and it rests either between walls or, in some cases, on heavy girders. The tiles are usually set in Portland cement, except that the first course is set in plaster in oraer to obtain a quick set and to dispense with a certain amount of centering. This system is almost always installed under a guarantee from the company controlling the patents, as to its efficiency and adaptability to the conditions of the special case in hand. Concrete-Steel Floor and Roof Arches. The types of concrete and concrete-steel arches are becoming more numerous each day, and only a few will here be discussed. They may be separated primarily into flat arches and segmental arches. In most of the systems of the flat-arch construction, the action is essentially that of a beam of concrete in which metal is embedded on the low side to increase the tensile strength, since concrete is not as strong in tension as in compression. In a few of the systems, however, when special-shaped bars are used at short intervals, the effect is more that of a simple slab of concrete supported by these bars, which act as small beams between the main floor beams. In the segmental form of concrete construction, the metal, where used, is generally intended more as a permanent center for forming the arch and for supporting it until the concrete has fully set, when the concrete is considered as taking the load independently of the steel center.